African Americans at risk for cardiovascular events have more non-calcified plaque in their arteries, compared with Caucasians. Non-calcified plaque is not detected by some screening tools, including calcium scoring. 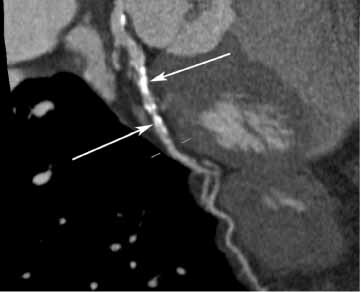 Contrast-enhanced coronary artery CT angiography is effective at measuring non-calcified plaque. CHICAGO — In a study being presented today at the annual meeting of the Radiological Society of North America (RSNA), researchers say they may have an explanation as to why African Americans, despite having lower amounts of coronary artery calcification, are at increased risk for heart attacks and other cardiovascular events compared with Caucasians. The answer, according to researchers at the Medical University of South Carolina (MUSC) in Charleston, S.C., may be increased levels of non-calcified plaque, which consists of buildups of soft deposits deep in the walls of the arteries that are not detected by some cardiac tests. Non-calcified plaque is more vulnerable to rupturing and causing a blood clot, which could lead to a heart attack or other cardiovascular event. "The African Americans and Caucasians we studied had approximately the same amount of plaque in their arteries, but different kinds of plaque," said John W. Nance Jr., M.D., researcher in the Department of Radiology and Radiological Sciences at MUSC. Calcium scoring with CT is a common screening tool for patients at risk for cardiovascular disease, because increased calcification in the coronary arteries correlates with a greater risk for a heart attack or other cardiovascular event. However, calcium scoring does not detect non-calcified plaque. Dr. Nance and a team of researchers compared 301 patients who underwent two types of CT imaging for acute chest pain: calcium scoring, in which the amount of calcified plaque in the coronary arteries is measured, and contrast-enhanced coronary CT angiography (cCTA), which provides a more comprehensive picture of the arteries, including the presence of non-calcified and mixed plaques. The study group comprised 50 percent each of African American and Caucasian patients, 33 percent of whom were male (mean age 55). Calcium scoring revealed that calcified plaque was much more prevalent in the coronary arteries of Caucasian patients than in the African Americans (45 percent, versus 26 percent). The cCTA revealed that, compared with Caucasians, African American patients had a significantly higher prevalence of non-calcified plaque (64 percent, versus 41 percent), and more of it. The median volume of non-calcified plaque among the African American patients was 2.2 milliliters (mL), compared with 1.4 mL among Caucasians. "This study confirms that the coronary artery disease pathways that lead to acute cardiovascular events are different for Caucasians and African Americans," explained coauthor U. Joseph Schoepf, M.D., professor of radiology and medicine and director of cardiovascular imaging at MUSC. "Coronary CT angiography is an effective and noninvasive tool for studying the pathology of atherosclerosis among different ethnicities." According to Dr. Nance, further research is warranted to determine whether non-calcified plaque detection can improve cardiovascular risk prediction for African Americans. In the meantime, the value of calcium scoring as a screening tool for this patient group should be reinterpreted. While cCTA does expose patients to ionizing radiation, according to Dr. Schoepf, the effective dose of this procedure has been considerably reduced over the past few years, making it a viable screening option. "For African American patients, coronary CT angiography may be a more appropriate screening tool for cardiovascular risk," he said. Other coauthors are Fabian Bamberg, M.D., J. Michael Barraza, B.S., Gorka Bastarrika, M.D., and Joseph Abro, M.A. 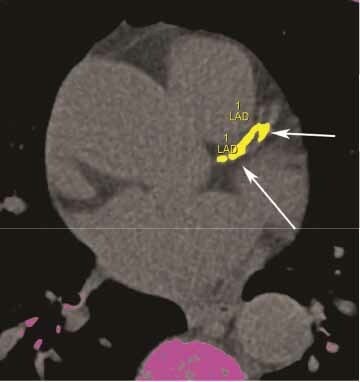 Figure 1: A non-contrasted computed tomography (CT) image used for coronary artery calcium scoring depicts calcified plaque in yellow. Figure 2: Calcium is seen deposited in the walls of a coronary artery on a contrast-enhanced computed tomography (CT) image from a 65-year-old Caucasian female. 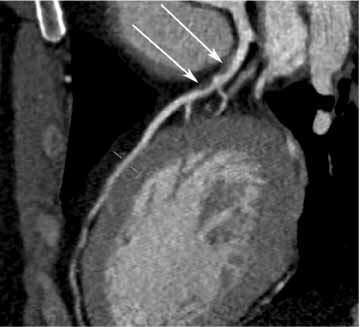 Figure 3: A contrast-enhanced computed tomography (CT) image is also able to visualize non-calcified plaque in the coronary arteries, as seen in this 48-year-old African-American man. 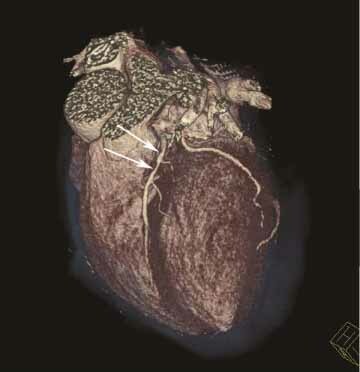 Figure 4: The effect of the non-calcified plaque on the shape of the coronary artery is seen in this 3-D image created from the contrast-enhanced computed tomography (CT) image seen in Figure 3.